I'm a high school first grade student in South Korea. Nice to meet you!^^ Our school is prestige school. We decided to participate a dissertation contest, which is the biggest event among all another contests! Proffesors from university were jury judge and we won third prize! So I would like to share my study results using the spectrometer that I ordered in here, public lab! We used an application and two phone films to block bluelight. 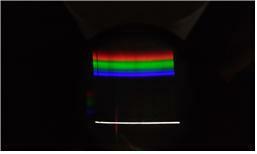 We also used spectrometer and a spectrum diffraction grid to find out the spectum of each case. Using a program called 'imaje J' helped us analyse the spectrums. Our team created different circumstances by combinating two films and adjusting the percentage of bluelight blocking application. Making the phone screen full of each color, which were red, green, purple, white we found out the spectrum by spctrometer and spectrum diffraction grid. After this, we analyzed all of the spectrums finding out graph which made us find out how much the bluelight was blocked. We also experimented in the kakao talk and facebook, which are two most widely used sns in Korea. We made a solution about the best condition to block bluelight and not disrupting the view of the screen when we use phones. Using film number2 and making the percentage of application 25% in daytime,using film 2 and making the percentage 65% in the evening was the most effective condition. In interior, using film 2 and making the percentage 35% was the most effective way.